The Israel Academy of Sciences and Humanities and the French Academy of Sciences have quite a long history of cooperation and collaboration. A 1989 bilateral agreement for scientific cooperation has flourished through joint conferences, symposia, and significant joint research and scientific projects. In honor of the 70th anniversary year of the State of Israel, the two academies convened joint scientific conferences, first in Paris in June of , and in Jerusalem. Nobel Prize laureates were present at both conferences and delivered papers. President Reuven Rivlin said when most people think of France they think of the Eiffel Tower, but when Jews think of France they think of Rashi, Rabbi Shlomo Yitzhaki, who in the 11th century authored a comprehensive commentary on the Talmud, and to this day is considered one of its greatest interpreters. Rivlin said that when he was presented with the title of the conference, he went to his Rashi compendium to see what Rashi has to say about borders, and saw that Rashi defined a border as a limit or an end. But science, said Rivlin, is infinite—without borders, without an end. Science cannot be limited by political boundaries because science is wisdom, he said. Knowledge is not enclosed within boundaries and not attached to any particular place, said Nili Cohen, president of the Israel Academy of Sciences and Humanities. Proof of this was Nobel Prize and Israel Prize laureate Ada Yonath who made her discoveries in Grenoble, France, said Cohen, emphasizing that “We need science without borders.” The language of science transcends cultural, religious and gender differences, and it transcends borders, she said, adding that science helps to build bridges between diverse societies. As for cooperation with French scientists, “It enriches us,” she said, underscoring that it teaches freedom, tolerance and good values. Here we have more definite proof that internationalism, also called globalism, does not recognize borders; it only recognizes one world. “Because science is wisdom,” it cannot be contained by any type of border. Regarding Israeli/French relations, we recall that it was the French who decidedly contributed to Israel’s nuclear know-how. Also, Israel’s most celebrated war, the Six Day War, was achieved with French technology, in particular their Mirage jet fighter. Israel’s president Reuven Rivlin’s statement: “science…is infinite—without borders, without an end,” is incorrect, because infinity is related to eternity, and eternity is in the hands of the eternal one: the God of Israel. He will one day return to planet earth, make an end of all the nations of the world, and indeed create, for the first time in human history, a true thousand-year kingdom of peace. 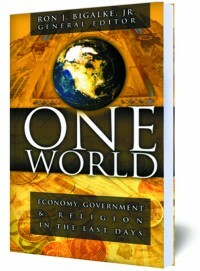 #2203 One World: Economy, Government, and Religion in the Last Days.